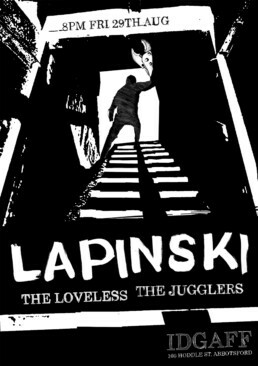 Lapinski were a classic Melbourne pub rock band - headed by none other than my multi-talented brother. I was responsible for their poster artwork, an immensely enjoyable job - not least because it called for genuinely unconventional ideas and a dirty, rough design aesthetic. 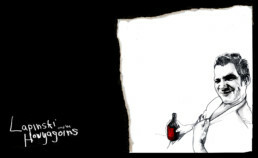 The artwork was made by combining roughly constructed pencil and digital sketches; all type was drawn by hand. The posters went up all around Melbourne, and in New Orleans where Lapinski played one legendary Nola gig. 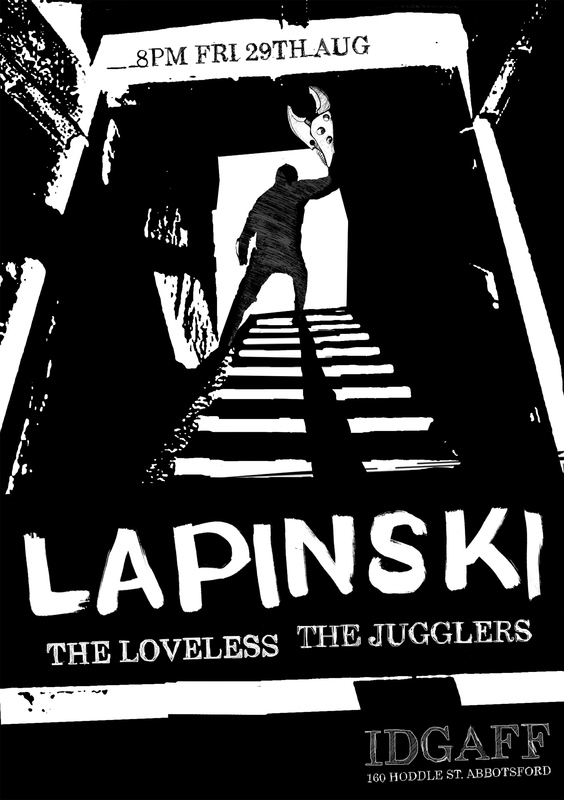 The first Lapinski poster referred to a fictional scenario involving the revenge of Clawman - locked in the dungeon, hidden from humanity, he triumphantly makes his way out into the stark sunlight, unstoppable and glorious, ready to take on the world with his giant mutant claw hand. 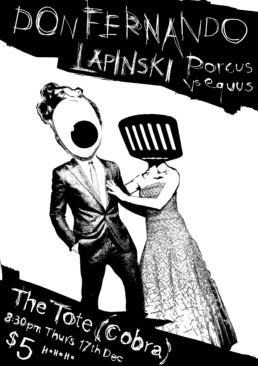 Lapinski played a wedding in New Orleans and I had the great honour of designing the poster. 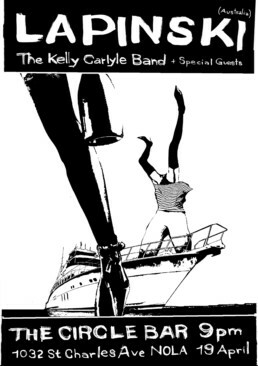 As they came all the way from Australia for the gig, I wanted to reflect the idea of travel, hence the boat - but also, importantly, the poster needed to reflect the celebratory interaction between two people that defines a good wedding, as well as the “launching” of new relationship, a bit like like a new boat in need of some serious champagne smashing. This poster was based on a photo of Twilight celebrities on the red carpet - people whose humanity evades us, turned into all but inanimate objects by entertainment news and tabloid magazines. I used kitchen items to hint at how ridiculous and empty media portrayals of these "relationships" can be, from exaggerations to outright fibs about non-existent ulterior motives, power plays and betrayals.